He was an ally of former FBI Director James Comey, and has been at the center of some of the bureau’s biggest cases in recent years. FBI Deputy Director Andrew McCabe, who served as the acting director of the bureau last year after Trump fired former FBI Director James Comey, is stepping down, NBC's Pete Williams first reported. 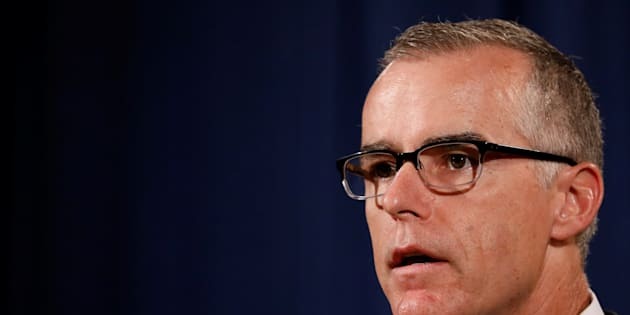 McCabe felt pressure to leave from current FBI Director Christopher Wray, according to The New York Times. Wray reportedly had concerns about McCabe's actions during the 2016 presidential election and suggested his deputy be demoted to another job, which made McCabe feel like he should leave the bureau. McCabe is leaving his position immediately, but he is set to be on the FBI payroll for a few more months, a source told HuffPost. McCabe has accumulated leave time that would bring him past the date where he'd be eligible to retire. The news wasn't a total shock, as McCabe had been expected to retire later this year. He was closely aligned with Comey, who was fired by Trump in May. Trump's firing of Comey is now part of the special counsel investigation being run by former FBI Director Robert Mueller. The FBI hasn't issued a public statement on McCabe leaving, and agents still at the bureau learned of his departure from news reports, according to the Times. Former Attorney General Eric Holder on Monday called McCabe a "dedicated public servant who has served this country well." He added that bogus attacks on the FBI and Justice Department were meant to "distract attention from a legitimate criminal inquiry" and were doing "long term, unnecessary damage to these foundations of our government." This article has been updated with details from The New York Times' report.